The season of Lent is upon us. This is a holy season for Christians who seek to identify with Jesus Christ’s 40 days of fasting as he prepared to be tested and later crucified. In order to identify with Christ’s self-sacrifice, Christians often join in a symbolic fast, giving up certain foods such as meat or chocolate or even giving up certain practices. In recent years, fasting from the internet or other forms of technology has become popular. 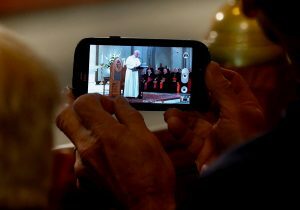 Fasting from technology is encouraged by many religious leaders as the ideal way for individuals to reflect on their daily dependency on technology. Sometimes called taking a “digital Sabbath,” it refers to the Christian and Jewish practice, in which one day a week is set aside as sacred. Unplugging from social media or limiting one’s internet use for a set period such as during Lent can be helpful for some individuals. My research, conducted over two decades, however, shows that some of core assumptions on which digital fasting is based on can be problematic or misguided. Technology can, in fact, be good for religion. The question is, how do we engage with technology thoughtfully and actively? First, let’s look at how religious groups interact and make decisions about new forms of media. In my recent book, “Networked Theology,” my coauthor Stephen Garner and I discuss how some religious communities believe the media primarily promote immoral values and frivolous entertainment. Therefore, they insist interaction with media via digital devices should be controlled, just as is done during a digital fast. In “Networked Theology,” we explain how abstaining from media is based on an assumption often referred to as “technological determinism.” It is a theory that argues media technology shapes how individuals in society think and act. Technology is presented as the central factor driving society, and its character is often described as selfish and dehumanizing. This view presents the internet as a medium that creates environments that disconnect us from reality. For example, YouTube could be seen to promote entertainment culture over wisdom, Facebook encourages self-promotion over community-building and Twitter facilitates tweeting whatever comes to one’s mind rather than listening. The truth is digital media is increasingly a part of daily routines. People learn, do business and communicate with technology. Often technology enhances our daily lives, such as eyeglasses correcting vision or the telephone helping people communicate across time and space. The problem, however, comes when we assume that people have only two options: to engage technology and inevitably be seduced by it, or refuse to use it in order to resist its power. Digital fasting follows this second option. It presents individuals as slaves of technology. Taking the occasional timeout from the all-powerful grip of technology is done in order to simply regroup and prepare to again face its irresistible seduction. In my view, such an approach places too much emphasis on the assertion that technological devices now dictate most people’s lives. It also does not take into account that technology users have the ability to make their own choices about how they approach it. So people can choose to use technology in ways that fulfill spiritual goals. In “Networked Theology,” we argue that digital technology can be reshaped by users. As others have written, we agree that people should take more responsibility for the time spent with their devices. So, instead of resisting technology during Lent, individuals could use this space of holy reflection to actively consider how to integrate technology to support their spiritual development. I describe part of this process as being “techno-selective.” What this means is reflecting on the technology we select and how and why we use it. It also means being proactive in shaping our technologies so they enhance and not distract from our spiritual journeys. A digital Lent can become about considering how our devices can help us do justice, practice kindness and demonstrate humility in our world. For example, people could ask if their postings on Facebook are helping in creating a positive or more abusive world? Or, whether the apps they use or their cellphone etiquette promotes peace and social change? In the last five years I have been working with a team of students at Texas A&M University to explore how social and mobile media are being developed that can support a variety of religious beliefs and practices. We found there are religious apps to help people do that. Internet memes also provide unique insights into common stereotypes about religion within popular culture. Memes can be crafted to counter such misconceptions. For example, the wearing of hijabs, or head scarves, by Muslim women is viewed by many outside the religion as oppressive, but wearing the veil and modesty are themes frequently affirmed in memes created by Muslims. Further, our research on religious mobile apps has found increasing numbers of apps are available that help individuals stay faithful in their religious practices on a daily basis. Apps can help with the reading of sacred texts, provide religious study aids, help locate kosher or halal products to maintain a holy lifestyle and connect people with places of worship and also to other beliefs. Prayer and meditation apps can help users remember when to pray and become more accountable in these daily spiritual practices. Also apps designed to encourage involvement in social justice causes, such as TraffickStop, Lose Weight or Donate and CharityMiles, help raise awareness of key issues and even help users link their daily practices, such as what they eat, to micro-donations to social justice organizations. Lent is a great time for religious individuals and groups to pause and consider not only their own technological practices and how they shape our world but also the ways in which digital resources can be integrated into their communities to support their beliefs. So instead of giving up Facebook for Lent, consider doing Lent digitally. Practicing 40 days of technoselectivity might actually have a longer-term impact socially and spiritually on one’s daily life. It could even deepen religious devotion.